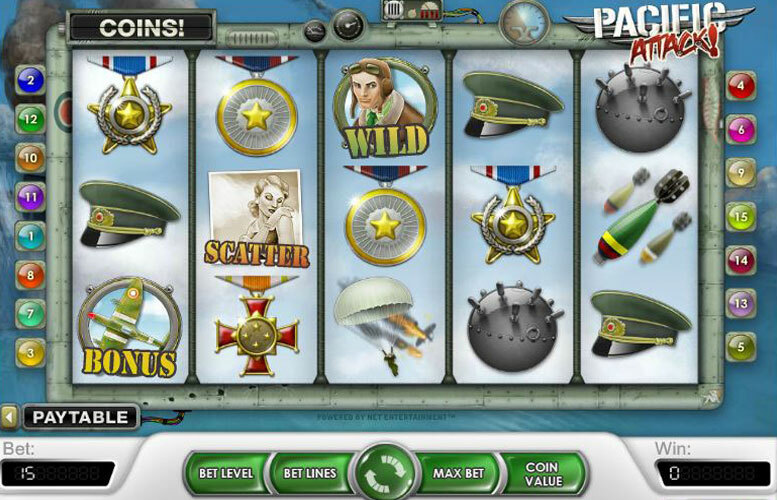 With a 300,000 coin jackpot, free spins and a battleship bonus feature Pacific Attack is one of the must play slots made by NetEntertainment. Give it a spin, bag yourself the x3 multiplier available and walk away with a fist full of cash! 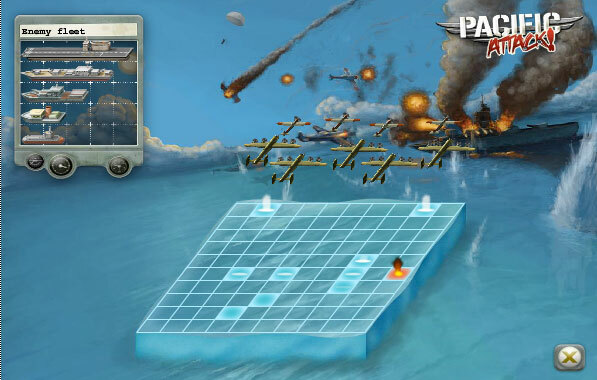 The Pacific Attack slot is based on a World War II theme. It has some great graphics to it, and although it has no continuous soundtrack, several of the symbols have their own unique sound affects that you will hear when these icons appear in your spin. You may detect a very faint conversation in the background that sounds like a radio transmission which helps to set the scene. Amongst the symbols you will see a variety of war related icons such as a selection of medals and bombs, for example. There is limited animation with some of the symbols such as the continuous flying of the fighter planes in the wild symbol. This slot will engage you with its air strike battles and its touch of romance with the scatter, who will immediately bring the famous Marilyn Monroe to mind. 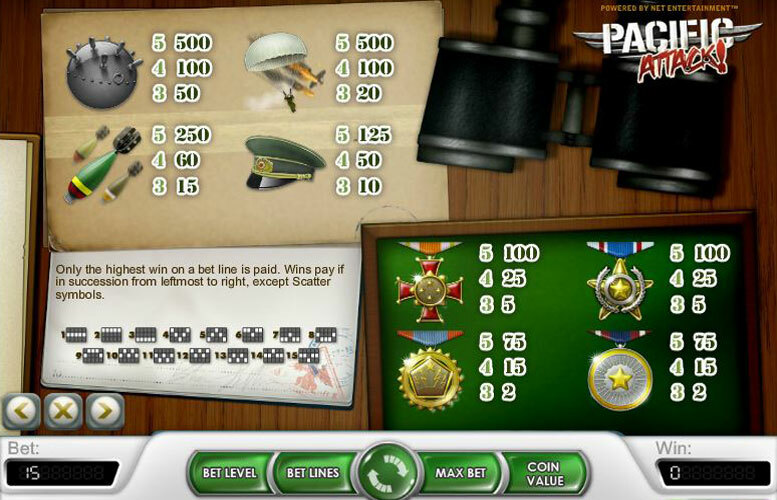 There are lots of features to keep things interesting such as a Battleship bonus feature and a free spin round. Then there are the scatter and wild to help add to your winnings. It’s a good option for players because you have the chance to win some big money payouts (300,000 coins being the top jackpot). During the regular play you have the chance to win up to 300,000 coins. This is achieved by playing max bet and getting 5 of the Piolts across all 15 paylines. 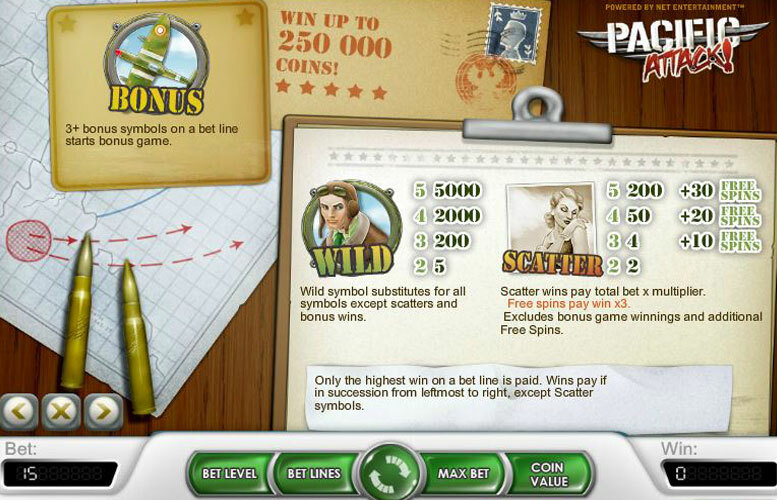 In the bonus game you have a chance to win a secondary jackpot of up to 250,000 coins. The amount won in the bonus game is dependent on how many of the bonus symbols you had spun that activated the game, which aircraft you choose while playing the game, and the amount of damage you inflict on the fleet during the game play. The bonus symbol is the circle with the bomber airplane in the center of it. The free spins bonus round is activated when 3 of the pin up girls (scatter) appear in a spin. You can win 10, 20 or 30 free spins. Any of the wins realized in the free spin game play are tripled. Also if you land 3 or more of these during the free game play you will be awarded another 10, 20 or 30 free spins. There is no limit as to how many additional free spins you can win in this manner. In order to activate this game the fighter plane bonus symbol has to appear from left to right on a pay line that you have placed a wager on. There has to be 3 or more of these in a consecutive order. Once the game is activated you have a mission to complete. Your job will be to destroy the battle fleet of the enemy. How much you win is determined by how much damage you can create, and how many battleships you can sink. There are 3 stages to this feature game. In the first stage you will see a group of bomber planes fly over the grid and drops bombs on the fleet of enemy ships. For each hit that is made you receive a bonus prize. In the second stage you get to choose a war plane that will bomb the fleet. Each specific plane will have a certain number of bombs to drop and there will be specific coin values attached per hit. In the third stage you have to select a specific target square to bomb. If there happens to be a ship in this designated area then it will take the hit and you will win a bonus prize. In addition to this, if the ship is sunk by the hit you will get an additional win. World war 2 pilot will pay 5,000 for 5, 2,000 for 4 and 200 for 3, with 5 for 2. Contact mine will pay 500 for 5, 100 for 4, and 50 for 3. The parachute will allot you 500 for 5, 100 for 4 and 20 for 3. The bombs will pay out 250 for 5, 60 for 4 and 15 for 3. The officer’s cap will pay 125 for 5, 50 for 4 and 10 for 3. The Victoria Cross medal or the Star of Courage medal in their respective groups will pay, 100 for 5, 25 for 4, and 5 for 3. The service medal or war medal in their respective groups will pay 75 for 5, 15 for 3 and 2 for 2. The scatter will pay out 200x for 5, 50x for 4,4x for 3 and 2x for 2. The scatter is the very lovely pin up girl that looks very much like Marilyn Monroe. This can be collected anywhere on the reels during a game play. If two or more appear she can complete a winning combination by substituting for other symbols. Getting three or more of these activates the free spin bonus. The bet range of this 5 reel 15 pay line slot is from 0.01 up to 0.20 coins per line. You have the option of betting the minimum of one coin on one line, up to 20 coins on each line for a max of 300 coins per spin. Unusually there are 20 different bet levels but this works well as it means you can be very flexible with the amount you wager. This game has a rating of 5 / 5 with 396 total reviews by the users.